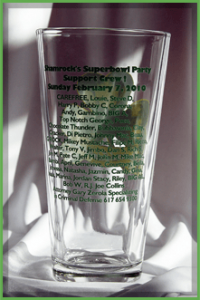 Commemorate your event with a custom printed glasses personalized with your choice of slogan/statement, date of event and attendees of your special occasion. 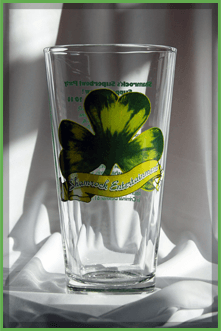 Personalize your Libbey 20oz Mixing Glasses. ALL ORDERS TAKE 10 BUSINESS DAYS TO PROCESS, FOR YOU TO RECEIVE YOUR ORDER IN TIME PLEASE ORDER WITHIN AT LEAST TWO WEEKS AHEAD OF THE EVENT FOR YOUR PURCHASE TO ARRIVE IN TIME.